If you’re a founder or potential founder and looking to raise seed capital, you’re entering possibly the most attractive period in a decade to start a business. A few weeks ago,we analyzed the impact of Series A and later stage VCs in the seed market. In the past four years, traditional VCs began to invest in seed-stage companies, which led to a rise in the number and size of seeds. But there’s another, more important force within the seed market: institutional seed investors. Shai Goldman collected fund raising data on these institutional seed investors’ fund raising patterns and published it over the weekend. Looking through Shai’s terrific data, I observed three trends. First, as the chart above shows, the amount of capital LPs are investing into institutional seed investors has grown by more than 3x in 4 years to about $3B in 2013. Six-months through 2014, another $3B has been invested. At this pace, seed dollars may grow by 8x compared to 2011. 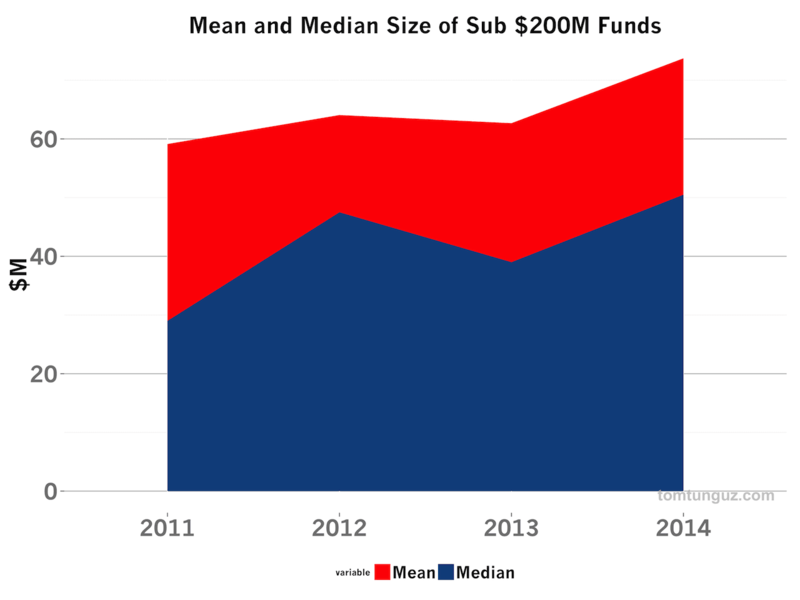 Second, median institutional seed fund sizes have increased by 66% to about $50M, likely driven by the great acquisition environment. Larger seed funds mean more follow-on capital for second seed rounds and throughout the lifetime of the business. Third, institutional seed funds’ share of total dollars raised has increased to about 20% of the total market through Q2 2014, which is an astounding figure. Just a few years ago, it was 5%. This is likely driven by LPs, the investors investing in VCs, who seek more diversification and access to new fund managers who can offer great returns. Consequently, there are about 150 new institutional seed funds created in the last few years. 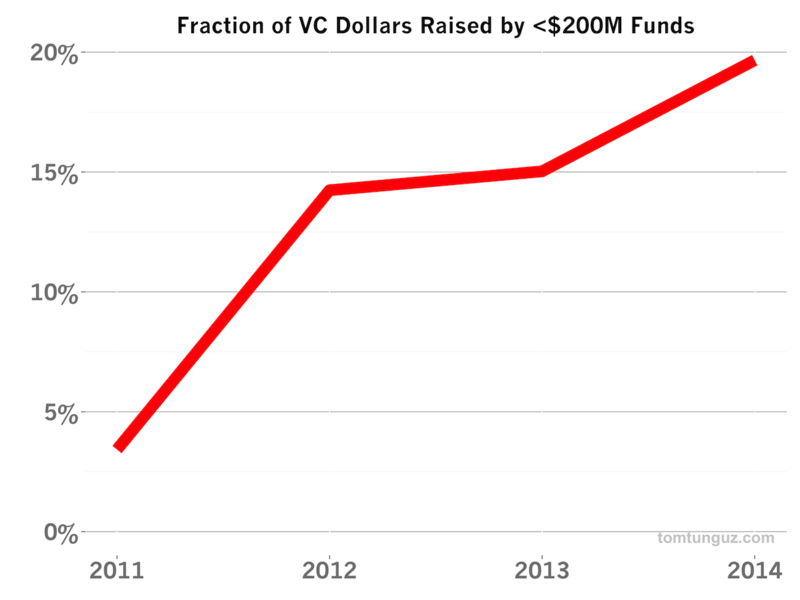 That means many more doors to knock on for founders and ultimately, a greater likelihood of raising a seed round. 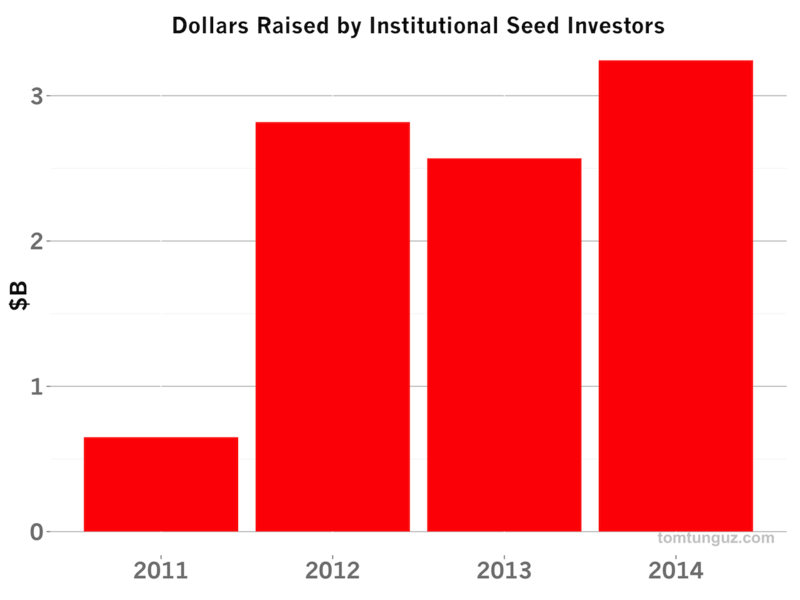 All in all, the seed market is one of the most fertile for founders in a long time. The amount of capital, number of institutional seed investors and sizes of these funds imply an increase in the number of seeded companies and greater follow-on capital. Thanks again to Shai for aggregating this great data and shining a light into a booming part of the market.